Provident Fund payment by employers is now accepted online only and not any more through banks as it was earlier accepted before December 2016. Provident Fund online challan generation and payment is now done through EPFO - Unified Portal only. Even for the payment of the monthly PF Challan, one has to login to the EPFO - Unified Portal. Now even after your PF Challan Payment online, the status of payment is under process and is not reflected immediately. So one is not sure if the payment for the PF Challan for the month has been accepted or rejected. To check this you will have to login again and see after some time. But there is a way one can check the status of the PF Challan payment without login using the TRRN no. of the challan. Here you can also take the printout of the PF Challan payment receipt without actually logging in into the EPFO portal for records. Below are the steps to Check Payment Status and get PF payment receipt using TRRN no. Here in the Our Services Section, Click on the link "For Employers" as shown below. 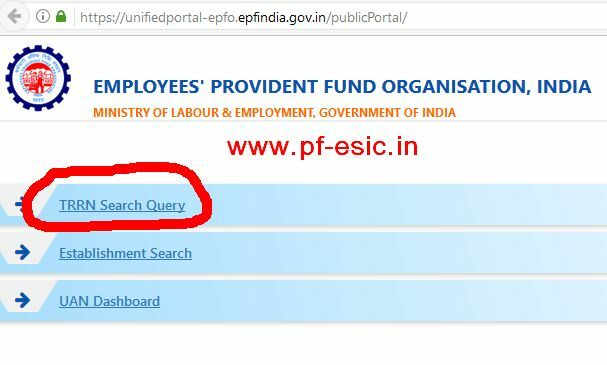 Now in the Services Section, you can see two link "TRRN Query (Upto December, 2016)" and "EPFO Establishment Search / TRRN Query". Suppose you want to see status of your PF payment for which the challan had been generated before December 2016 then you will have to click the Link "TRRN Query (Upto December, 2016)"
Here you will enter your TRRN no. and the captcha to see the status of the PF Challan payment as shown. You can also download the status as a PDF. Now to see the PF Challan payment status of the Challan prepared after December 2016, you will have to click the link "EPFO Establishment Search / TRRN Query" in the services section. After clicking on the link you will see a page as below, where you will have to click on the TRRN Search Query link. Now you can see the page where you have to enter your TRRN along with the Captcha and click on Search button. Clicking on the search button will provide you the status of the PF Challan with TRRN number you entered along with other information such as Challan generated on, Establishment ID, Establishment Name, Challan Type, Total Members, Amount, Payment Confirmation Bank, CRN, Payment confirmed on and some more as shown below. Here you can also Click on the Download PDF button on the upper right corner as shown above to download the receipt of payment and status of the PF Challan as shown below to keep for your records. 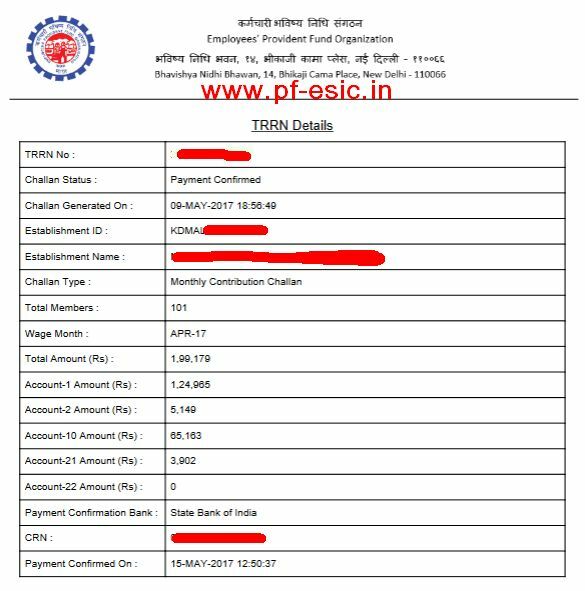 This is how you can get the Provident Fund payment receipt and status using TRRN number. EPf ka payment 6th February 2019 ko Kiya hai per Abhi tak Staff ke Account mai Nahi deek Raha Hai.